Every gamer wants to do whatever they can to reduce their latency. Some will spare no expense at getting the lowest ping to guarantee that nothing impedes their personal success. A poor signal can cripple any eSport or online game, casting you out of the running due to nothing more than a lag spike. Here’s a look at the best wireless adapter for gaming of 2018 so that you can cut it out the equation completely, and rest assured that you’ve got the best ping possible. 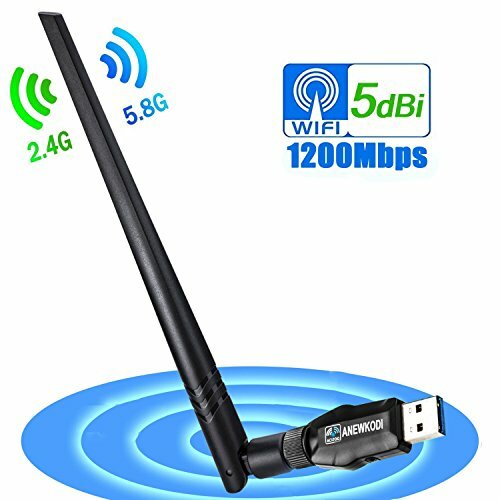 Will a wireless adapter improve my latency/ping? What range can I expect from my wireless adapter? Can I use these wireless adapters for a console? How do I install a wireless adapter without an optical drive? 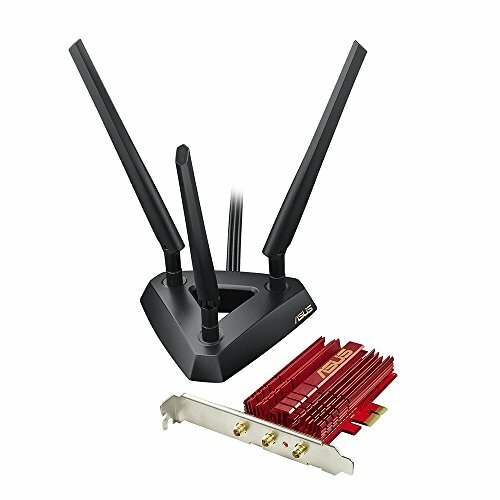 Do I need a wireless adapter or a router? Operating on both 5 Ghz and 2.4 Ghz, the Inamax 1200M bps USB 3.0 Wi-Fi Adapter is a high-throughput device boasting outstanding compatibility and fantastic range boosting performance. Thanks to its supreme ease of use and unbeatable top speed, this is a Wi-Fi adapter which everyone should consider. Here’s a closer look at what makes this one of the best devices for demanding connections such as fiber optic and other high-speed internet. The dual-band performance of this adapter is top notch. It offers 867 Mbps when connecting via 5.8 Ghz Wi-Fi, and 300 Mbps over 2.4 Ghz. Thanks to the USB 3.0 connectivity there is no bottleneck and sufficient power for reliable operation in both modes. A significant signal increase can be expected perfect for those with poor reception or interference over range. It is fast enough to replace any existing ethernet cables and is easy to setup, requiring nothing more than a wizard-based install using the mini-CD provided. Using a reliable RTL8812BU chipset, you are guaranteed to find up-to-date drivers for all platforms even Linux. If you’re one of those lucky users to have access to 500 Mbps+ connection speeds then you’ll love how you can share your access at near top-speed via 5.8 Ghz to almost anywhere on the property. It is an outstanding replacement to any onboard Wi-Fi device, giving a performance boost which will surprise most users. Inamax are so proud of their product that they offer any dissatisfied users a full refund or a new replacement instead of providing repairs and troubleshooting. You’ll struggle to match the connection speed, throughout and packet prioritization for gaming. A common complaint is the slight difficulty of installation. Inamax hasn’t made their Wi-Fi adapter completely plug and play. On Windows platforms, you’ll need to install off the disk rather than having the device automatically install itself. If you don’t have an optical drive then this could pose a problem. You’ll need to get online to download the drivers first. Their installer completes within a few steps but you need to reboot before its operational. Despite coming in at a slightly higher price than its competitors, the Anewkodi 1200 Mbps USB 3.0 Wi-Fi Adapter is a dual-band device boasting an extended warranty and elevated ease of use. Here we’ll be taking you through a look at this well-designed wireless adaptor for gaming and high-speed internet access. Stable, high-performance, and filled with features, this is a reliable buy even for demanding users. 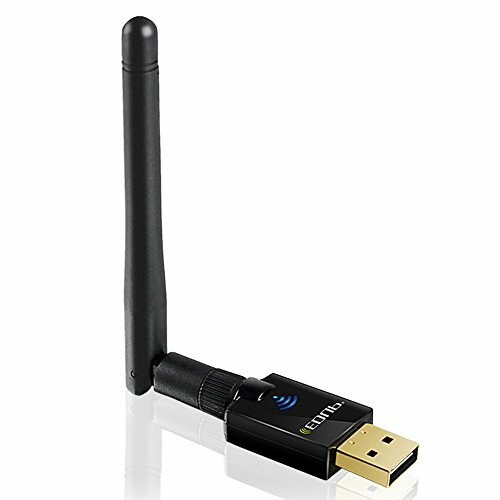 This wireless adaptor uses a reliable Realtek RTL8812BU chipset. Drivers for all platforms supported are compiled and published under multiple revisions through the course of 2018. 5.8 Ghz Wi-Fi speeds reach 867 Mbps (802.11ac) and 300 Mbps at 2.4H Ghz, or 802.11n. The 5 dBi removable antenna works well and maintains a good signal even when penetrating multiple walls. Configuration is available either through manual setup or secure WPS, Wi-Fi Protected Setup. This makes configuring your connection very easy and extremely secure. Thanks to USB 3.0 connectivity, full-throughput is available even when at maximum data transfer speed. If you’re running Windows 10, then this wireless adapter is completely plug-and-play; you don’t need to install anything and Windows does all the work. Within minutes you’ll be up and running and ready to connect. All other OS’ will need to install the drive off the mini-CD first, leaving downloading the driver on another machine as the only option for those without an optical drive. Another fantastic part of this wireless adapter’s design is just how stable it is. Even when copying large files across the network, or gaming and streaming, there is no variation in the speeds reported. Ubuntu users be warned – there are no compiled drivers for this wireless adaptor. Generic drivers report mixed results but it is an adaptor which only Windows and Mac users can safely buy. If you’re experienced, there are a range of options involving updating your kernel and installing generic drivers. The Lotekoo 600Mbps USB Wi-Fi Adapter delivers astonishing value and considerable features for its low price. The maximum transfer speed is rather limited when compared to 1,200 Mbps wireless adaptors however as a portable solution its worth can’t be questioned. Here we’ll be taking you through a look at the top highlights, product features, and drawbacks of this handy wireless adapter from Lotekoo. You get 433 Mbps at 5.8 Ghz and 150 Mbps at 2.4 Ghz from Lotekoo’s wireless adaptor. It runs on a Realtek chipset with 2018 drivers provided via a mini-CD, and there are downloads available online. You are given a 5 dBi removable antenna which is known to have good penetration over an extended range. A strong signal is to be expected which remains stable for days on end. WPS setup makes everything easy and removes the need for long security keys. The option to configure your connection via WPA, WPA2, WEP, 802.1X & WMM is also supplied. CCA technology supports your signal strength by avoiding channel conflicts. One thing which is quite surprising about this low-cost wireless adaptor is just how well its plug-and-play functionality works. Unlike even major brands, reports across the board detail a hassle-free auto-installation across all platforms supported. You also get a comprehensive 100% customer satisfaction warranty for 18 months. Lifetime customer support is also given with support responding to all queries within 18 hours at the most. Linux is not officially supported, but Ubuntu users have been successful in installing this device. 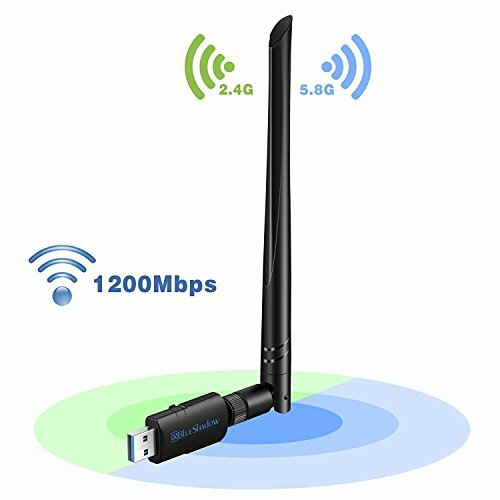 Other than the limited 5.8 Ghz connection speed set at 433 Mbps, the only drawback to the design of this wireless adapter is how physically large the device is. It can pose to be quite an obstruction when being used in busy areas where space is tight. 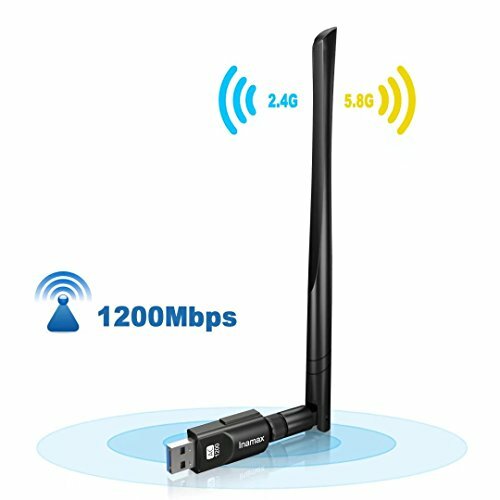 The EDUP 600Mbps USB Wi-Fi Adapter with 2 dBi antenna is an affordable, reliable option for anyone who wants to set up a medium-range high-speed network. Certain sacrifices are made to reach its low price point but the performance, stability, and value is commendable. Here we’ll be taking a closer look at this cheap wireless adapter for gaming from EDUP. EDUP’s wireless adapter is backward compatible with 802.11g/n but provides 433 Mbps on 5 Ghz Wi-Fi, and 150 Mbps on 2.4 Ghz. The dual-band technology prides itself on lowering interference, with roaming integrated to ensure effective wireless connectivity. Instead of USB 3.0, this USB 2.0 adapter supports all Windows operating systems and MacOS and is covered by a lifetime warranty. The connectivity which this EDUP adapter provides is nothing short of outstanding. You can expect an improvement to your general latency and download rate thanks to the large throughput and cool-operation. There are absolutely no overheating issues and the connection stays stable for weeks on end when needed. Another upside to this adapter is that it’s confirmed as working with Linux. The driver disc even has a Linux driver ready with instructions on how to compile it, and some users report the software updater automatically finding it. On Windows and MacOS the device is completely plug-and-play, giving you connectivity within 30 seconds. If you can’t insert the mini-CD then you’ll need to download the drivers first as the device doesn’t auto-install on any other operating system other than Windows 10. Even though the AP mode is available whereby you can turn your wireless adaptor into a hotspot, the feature doesn’t work on Windows 10. 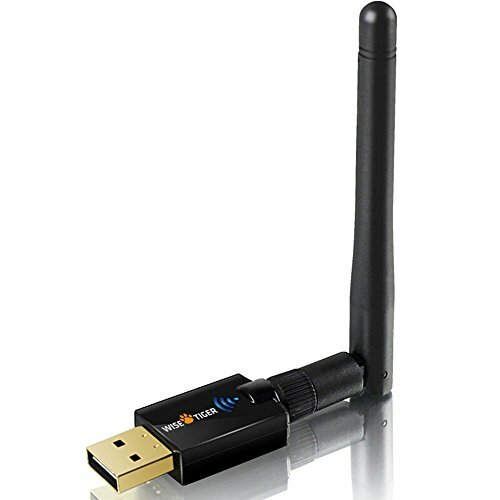 The only other draw-back to this affordable wireless adapter is how it utilizes a 2 dBi antenna instead of a 5 dBi like other models. While this does mean better 2.4 Ghz performance, most users are looking for better long-range 5.8 Ghz signal instead. 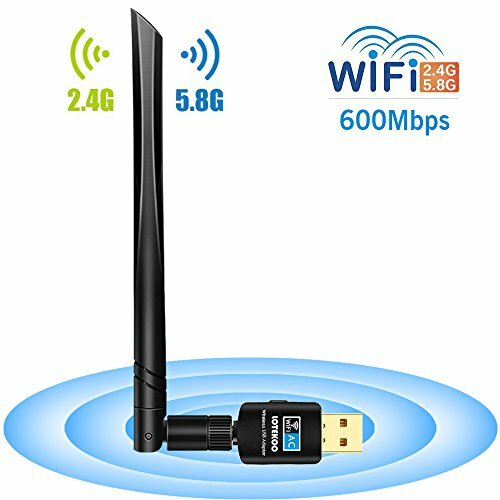 With a performance to price ratio which is hard to match, the Wise Tiger 600Mbps Long Range Wireless Adapter is easily the best 600 Mbps device out there. It’s auto-install, great range of computability and small form factor make it a clear winner in its class. Let’s take a closer look at the affordable yet value-packed Wise Tiger 600Mbps Long Range Wireless Adapter. Featuring 5 Ghz operation at 433 Mbps and 2.4 Ghz at 150 Mbps, Wise Tiger’s performance is equal to the best devices out there. Its 2.4 Ghz connectivity is standard but in terms of 5Ghz speeds and stability, it excels offering outstanding value for its price. Don’t let the relatively unknown brand name fool you. Beneath its shell is a powerful, reliable Realtek chipset which has been wonderfully integrated and configured. This is one of the smallest wireless adaptors you’ll find, making it a great option for those who need mobile connectivity. The automatic installation works flawlessly across all platforms supported. You’ll also notice that Linux support is provided out-the-box which specialized support for Ubuntu. If you’re looking for a wireless adapter which is effortless to install and configure no matter where you use it, you can’t go wrong with this great option from Wise Tiger. If you don’t have USB 3.0 onboard then this is the best wireless adaptor for you but the lack of USB 3.0 support does constrict you to a lower connection speed. However, if you’re looking at a 600 Mbps device then it’s likely that your connection speed is sub-500 Mbps, making Wise Tiger’s adapter a wise choice. Faster users such as those on fiber optic internet or high-end LTE should rather go for a 1,200 Mbps device. The Blueshadow 1200Mbps USB 3.0 Wi-Fi Adapter is one of highest quality wireless adapter’s available. Despite its durable manufacturing and superbly stable signal boosting capabilities, it manages to remain affordable. It is the perfect adapter for those who have a wired connection and want to share it wirelessly thanks to the flawless access-point functionality supplied. Let us take you through a look at why this could very well be the very best wireless adapter for gaming in 2018. The connection rate provided is stable at 433 Mbps when using 5.8 Ghz, and 150 Mbps at 2.4 Ghz. Realtek drivers are readily available and fully updated for even Linux platforms. Using the RTL88x2BU chipset, you can find even the latest Ubuntu distro supported and compiled, ready to download. WFA, WPA, WPA2, WPS2.0 & WAPI configuration is supported and the adapter is capable of running in 802.11n/g/b & 902.11ac. Plug-and-play installation is supplied with your Blueshadow wireless adapter installing within seconds on even older hardware. The omnidirectional 5 dBi antenna feels sturdy and appears to work better than competing antennas. Without taking up much space, you can generally pinpoint a good signal within a range of just over 50 feet no matter the obstacles. One of the best features of this wireless adapter is its ability to be set up as a hotspot, sharing the internet with any devices within its large range. Unlike other competing hardware, this feature works and works well. Adding to the value of this device is its 18-month warranty. If you’re not happy, Blueshadow offers a refund or will replace the device. Some users report their devices only lasting for a short period longer than the warranty. While this is far from common, it can be expected given the low-price at which Blueshadow supplies this powerful wireless adapter. Nonetheless, performance during its operation is far more stable for longer periods than similar hardware. If you are a desktop user and want one of the best dual-band wireless adapters for gaming available and are willing to fork out a reasonable sum, then the ASUS Dual-Band Wireless AC 1900 PCI-Express Adapter is a leading choice. It’s among the best signal solutions available for desktop users. Here’s a closer look. When you combine the AC1900 PCI-express network adaptor with flexible antennas mounted to their magnetized stand, optimal signal quality is guaranteed. A stylish aluminum heatsink ensures cool operation in any climate rewarding you with uninterrupted low-latency gaming at as fast as your connection can run. Unlike older hardware, 5th generation 802.11ac allows for connection speeds up to 1.3 Gbps, making this the best wireless adaptor for fiber optic internet sharing. This technology standard also prioritizes your data according to what services are being used. You can’t hope for a better ping off your connection. The stand comes with a 40-inch cord which is quite generous and more than enough for prime placement. Thanks to its dedicated design, the three antennas have the benefit of high power at their disposal. This guarantees that you get enhanced coverage averaging 150% greater than evenly matched specifications while having no dead zones. The performance of this combo is unbeatable and it is fully compatible with PCI Express 3.0. As you can see, each aspect of this wireless adaptor’s design is up to present-day communications standards. You get a low-profile bracket standard with each wireless adapter but the antennas could be better. The only flaw in this otherwise outstanding design from Asus is the how then stock antennas are only 3 dBi. While still better than an entry level 2 dBi, they are certainly nothing special. Despite this minor caveat, the performance, stability, and range still make it better than almost any other setup. Here’s a look at what to look for when shopping for the best wireless adapter for gaming of 2018. The best match for you will be suited to your connection type, the distance at which you’re sharing your internet, and the type of computer or hardware you’ll be using for your gaming. Wireless adapters for gaming will generally give you two frequency ranges, namely 2.4 Ghz and 2.8 Ghz Wi-Fi. You should always look at the individual maximum transfer speed provided by any prospective device. 1,200 Mbps devices will not always necessarily give you a transfer speed fast enough to handle high-speed internet like 4G or fiber optic. Pay attention to how fast you can transfer data as it is the measure which lets you know how your Wi-Fi compares to a cabled connection. The best devices will give you 867 Mbps at 5.8 Ghz which comes close to a 1 Gbps ethernet network, while you can expect a top end of 300 Mbps on 2.4 Ghz. You don’t necessarily need such as high speed depending on the speed of your internet connection. At times, 600 Mbps wireless adapters are more than enough. The next factor which you need to keep in mind is what type of USB connection you’ll be using. If you have USB 3.0 support then you have to get a wireless adaptor which fits the standard in order to reap the full benefits of your hardware. USB 3.0 is also essential for communicating at higher than 500 Mbps, as is the case when using high-end dedicated internet services. Yet, if you’re looking to boost the signal and ping across a network with older technology, then all that you need is a good USB 2.0 adapter which will handle through throughput. Device compatibility and ease-of-installation should also be considered. If you’re not the technical type then you want true plug-and-play functionality. Similarly, Linux users should pay very close attention to whether or not they’re supported. Even some of the best wireless adapters for gaming in 2018 do not support Linux distributions out-of-the-box but do work after a few manual updates and package installations. Not all users will need this feature but an integrated access point allows your wireless adaptor to transform your wired internet connection into a Wi-Fi hotspot. This can be invaluable to some users but gamers should keep in mind that the extra strain on their rig will affect their latency relative to the other users on the network and the amount of bandwidth they’re pulling. Almost every good wireless adaptor will allow you to configure its security in a range of different ways but look for WPS as it makes things quick, easy, and secure. An upgrade to your network adapter does not directly translate to a lower ping. However, if you are using mobile hardware then a dedicated wireless adapter will definitely give you a better connection speed, throughput, and lower latency. If you are connecting to an internet connection wirelessly and are suffering from an inconsistent signal (frequent disconnections, extreme lag spikes) then upgrading to a fixed wireless adapter for gaming will most likely help immensely. 2.4Ghz Wi-Fi gives a maximum range of 150 feet indoors and 300 feet outdoors. New 5.8 Ghz technology is capable of giving you miles worth of range outdoors and over 300 feet indoors but the communications standard itself is much faster. 5.8 Ghz Wi-Fi should be used by anyone who has a router which is capable of it as the frequency is far more efficient than any other. Also, pay attention to the antenna of your wireless adapter. The higher the dBi rating, the better for signal penetration. Consoles and smart televisions will not be able to use a wireless adapter for gaming, as reviewed above. Dedicated signal-boosting hardware will be needed to amplify the reception of a console. Conventional USB wireless adaptors require their drivers to be installed and are interfaced with through custom-coded control panels. Even though the communications hardware is often the same in stand-alone wireless adaptors, the device cannot operate without its software installed and there is no way to install the software for these adapters on your console, television or other smart electronics. Most good wireless adapters for gaming are totally plug-and-play compatible. Windows 10 auto installs most adapters but in certain cases, you’ll end up needing to install the driver. With drivers being supplied on a mini-CD, those without an optical drive can quickly find themselves stuck. If your wireless adapter won’t install, you’ll need to download the drivers using a computer which has an active internet connection and then transfer them to your PC or laptop with the help of a USB flash drive. Any installation issues are usually overcome by installing the driver before you plug the wireless adapter itself in. Firstly, you need to establish whether your signal strength to the individual device is suffering or your connection to your service provider. Out-of-date routers using communication technology which is inefficient can result in bottlenecking preventing you from getting the most out of your wired or wireless internet. All onboard hardware can generally be upgraded to a better, dedicated version of the same chipset. Dedicated wireless adapters for gaming will always outperform an onboard wireless device but you won’t see gains until your internet connection is fast enough. If you’re lagging and aren’t sure, upgrade. If you’re a desktop user and are the type of person who wants to stay on the cutting edge of technology, guaranteeing yourself the lowest latency while still cutting out the cable then you can’t go wrong with the ASUS Dual-Band Wireless AC 1900 PCI-Express Adapter. Even more versatile than this leading PC-based option is the Inamax 1200Mbps USB 3.0 Wi-Fi Adapter. It’s the best wireless adapter for gaming of 2018, hands down. Between its cross-platform computability, fantastic high-end speed and jaw-droppingly low price, Inamax have manufactured a winner for desktops and laptops that should not be overlooked.